On November 24th, EPA Region 6 issued a pre-publication version of a proposed federal implementation plan that would seize Regional Haze programs run by Texas and Oklahoma pursuant to the Clean Air Act. A final proposal will be published in the Federal register any day now. I’ve only started acquainting myself with the document, but media reports indicate that the costs of these FIPs would be $2 billion. When I’m up to speed on the rule, I’ll post a summary. Given EPA’s history of Regional Haze FIPs, about which I wrote a study, there’s a high probability that this rule would achieve literally invisible “benefits” in exchange for the billions it would cost. 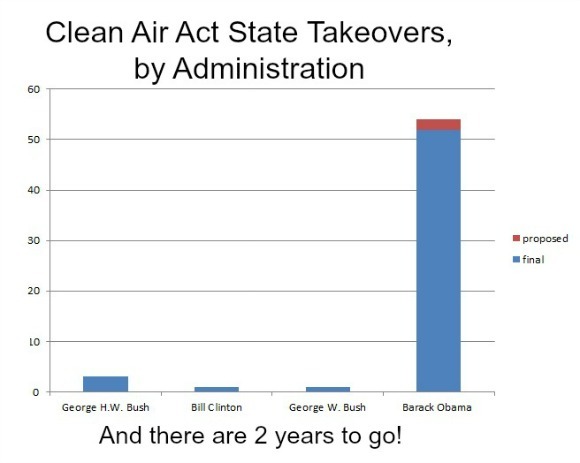 Globalwarming.org has been keeping a running tally of Obama-era Clean Air Act FIPs (below). The president is up to 54, which is almost 11 times the sum of his three predecessor administrations!